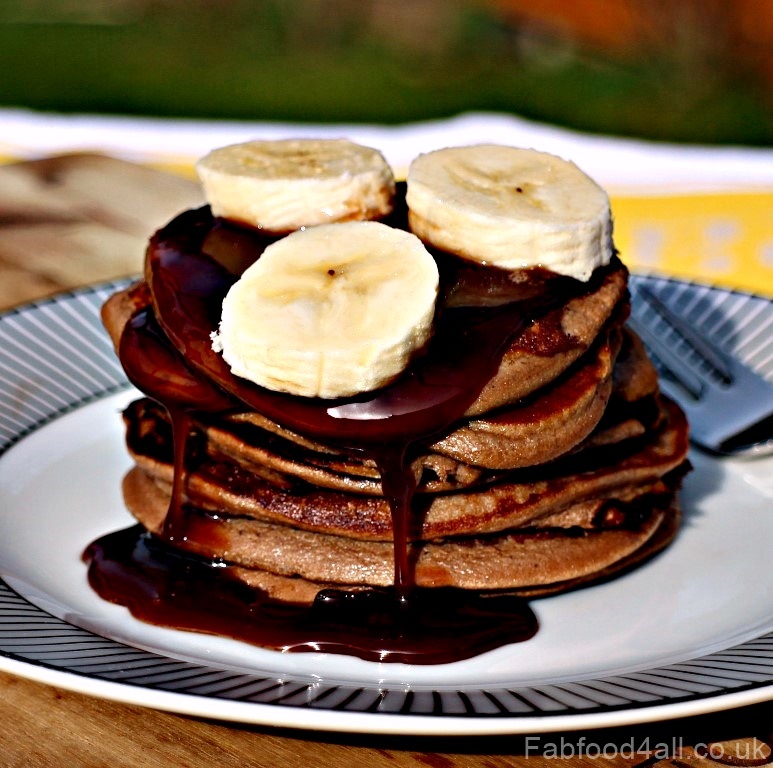 Today I’m bring you 3 Ingredient Banana Nutella Pancakes! My daughter is obsessed with Nutella, bananas and pancakes like many children and for the past few nights she’s wanted me to make pancakes for dessert. This morning I discovered on the internet 2 ingredient pancakes which comprised of just banana and egg. There were many recipes for this simple pancake so I can’t credit one in particular but I decided to experiment and add Nutella to the mix as chocolate and banana are such a great flavour combination. I whizzed up a trial batch really quickly but I’m afraid I had the pan on too hot and I ended up with charred pancakes. As they are quite plump these pancakes want a slightly longer cooking time over a not too high heat. It’s best to keep an eye by lifting up the pancakes to check underneath whilst they’re cooking. They may still look really wet on top but once they look tanned underneath don’t hesitate to flip! I happened to have some chocolate syrup in the house but you could use any syrup or sauce of your choice and ice cream would of course be divine. The range of toppings you could use is limitless! Hubby was out when I made these this morning and after taking my photographs I gleefully ate half the stack and left the other half for my hubby. When he got back I offered him the half stack and his verdict was a resounding 10 out of 10 and a plea to make them again soon! Looks like my daughter will have her wish come true tonight as I will be making these pancakes for her and her brother. The recipe below makes 7 small pancakes and I leave it to your discretion as to whether it serves 1 or 2 people. I would be happy with a half portion but I’m sure men would happily wolf down a portion to themselves. If you have a family member allergic to wheat or gluten then these pancakes are ideal. If you wanted to make them dairy free you could always use dark chocolate spread instead of Nutella. 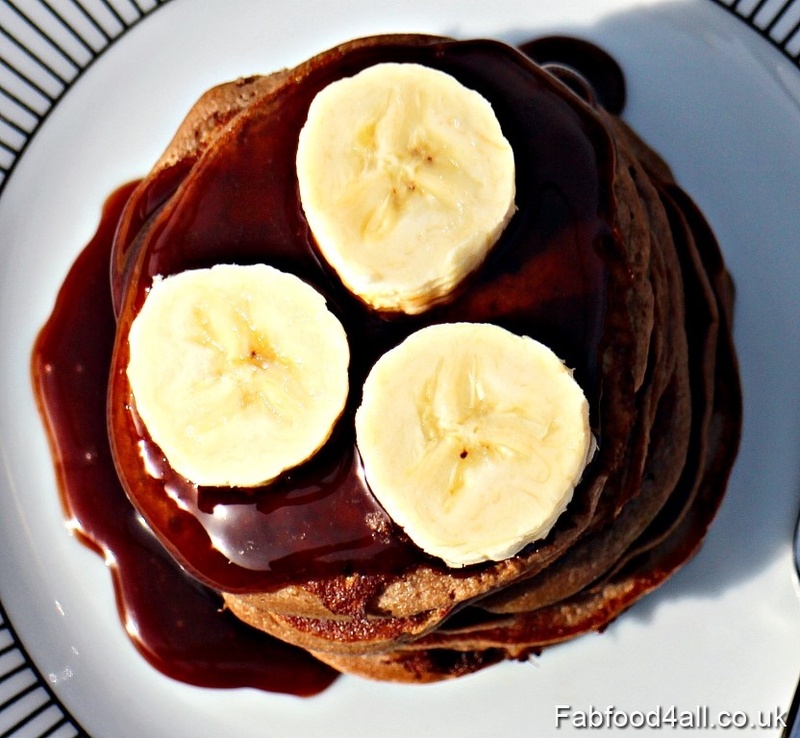 These 3 Ingredient Banana Nutella Pancakes are healthy (great brain food), low in fat and extremely frugal as bananas are so cheap. Ideal for breakfast, a snack or as a dessert I think you’ll be making them time and again! I’m entering these pancakes into Credit Crunch Munch run by myself and Fuss Free Flavours hosted this month by Jo’s Kitchen. I’m also joining in Belleau Kitchen’s new linky Simply Eggcellent as this dish contains free range egg. 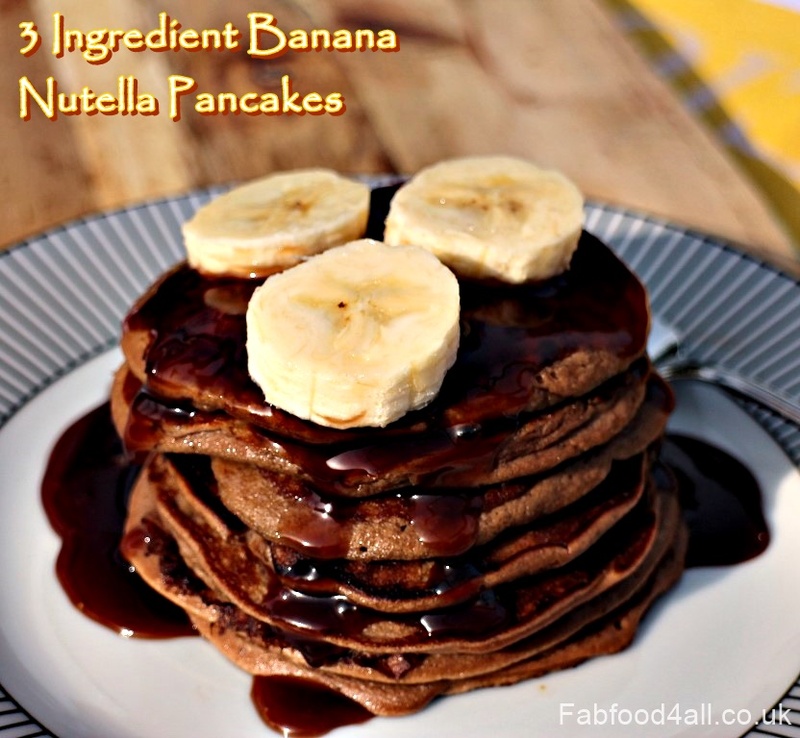 Healthy and deliious, these 3 Ingredient Banana Nutella Pancakes are wheat and gluten free and perfect for hungry kids and adults as a breakfast, snack or dessert. Put the banana, egg and Nutella into a beaker and whizz with a stick blender until thoroughly mixed (or use whatever blender you have), lifting the blender up and down to get extra air into the mixture. Heat a drizzle of oil in a skillet or frying pan over a medium heat, tipping the pan to spread the oil. Pour the batter onto the pan to form roughly 7cm diameter circle (best to start with a single one to test for correct pan temperature). As the pancake cooks use a pancake flipper to check the underside and once the base has a tanned appearance flip and cook through the other side. 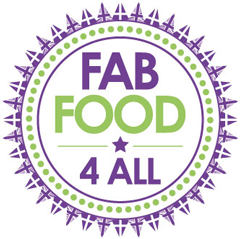 Repeat for all the pancakes, topping up the oil for each batch (you should be able to cook 4 at the same time). Serve individually or in a stack topped with chocolate syrup and banana slices or any other topping or fruit of your choice. Ice cream makes it into a fabulous dessert. I can’t wait to try these. They look amazing. 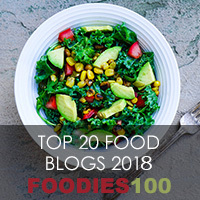 I’ve seen this recipe around on the internet and have been dying to try it but it seems too simple – like there must be a catch! Now I’ve seen your pics, I’m really tempted to give them a go tonight! We have loads of bananas ‘in stock’, so they need using up! You make it look so easy – oh and tasty!